It was slower than I expected, but that wasn’t too much of a surprise as I really didn’t push the pace at all. I finished 3.5 miles in exactly 35 minutes. Eerily exactly on the nose. Yes, one minute over my prescribed 34. 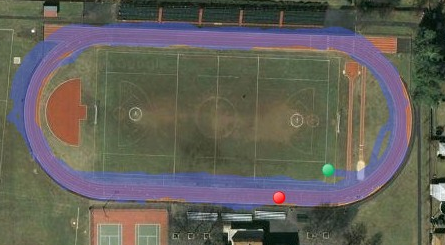 I ran the track and kept careful track of the laps and where I started. When 34 minutes passed and I wasn’t yet at the 3.5 mile mark, I decided to finish out the distance. So my pace was exactly 10 minutes per mile. Again the CardioTrainer app tracked .25 miles more than I actually ran. I think I found the culprit. Perhaps it’s more accurate when running a straight line. Taking a look at the map overlay, you can see my route running off the track. I ran around the inner lane, not along the outer lane or even in the grass (which the overlay shows). The lane can make a pretty big difference, as you can see on ERaceWalk.